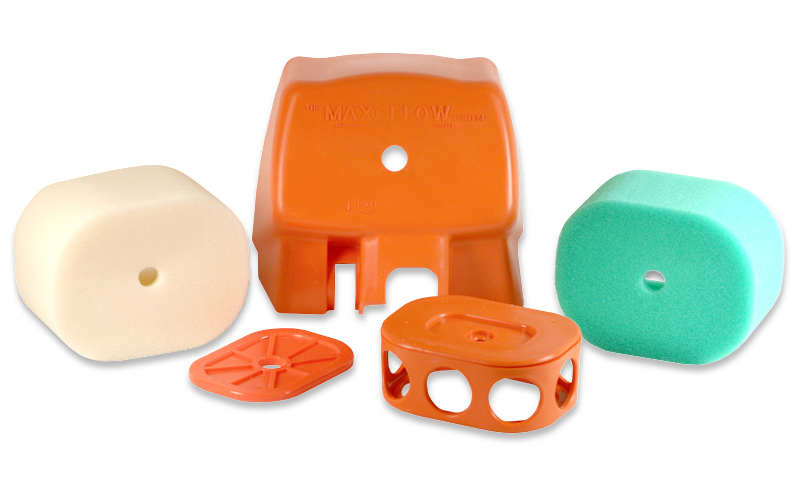 MAXFLOW FILTERS MAKE YOU MONEY! Your saw will perform consistently at maximum performance so you won't have to stop in the middle of your work to clean the filter. The Max-Flow Filter System is more economical to buy, more cost-effective to maintain and more efficient to use. Upgrading to a filter system that pays for itself many times over. Max-Flow Filter are very easy to clean. Wash the foam element in solvent to dissolve the filter oil, then rinse in soap and warm water. Re-oil using a good quality foam filter oil from Bel Ray, Uni or No-Toil. These oils will maximize the efficiency of the kit. Price, performance, and durability are all the things that a logger must consider when selecting a professional saw. To this end, today's manufacturers constantly upgrade their saws to attract the pro user. It is rare then, to have an aftermarket company come up with an innovation that will significantly enhance the performance of a saw. A new product must pass the harsh durability standards that this profession demands, yet still sell for a competitive price. The patented Max-Flow™ Air Filter System can increase your Stihl® chainsaw filters performance by up to 300%, and has proven itself to be the best filter system available for the Stihl® MS440, MS460, MS660 and MS880 chainsaws. Here's how: The unique oil coated polyurethane foam element creates a honeycomb type maze with no direct passage for sawdust or dirt particles to travel through. Ordinary gauze filters are made of paper, coated with a light oil. Called surface filters, they have only one chance to stop dirt from entering your engine. Once a dirt particle moves past the surface, it has a clear path to potentially cause damage. Airflow to the engine is reduced as the filter's surface fills with particles; the end result is a loss of power. When you are ordering inventory for the upcoming year, you try to stock only the best products. Should you keep your existing chainsaw filter or upgrade to the Max-Flow Filter System? First of all, compare the cost of keeping your present H.D. filter to the cost of our filter system. The cost of one Stihl® factory filter element is $29.95. With a Stihl® recommended replacement of one filter a month, a year's cutting will cost $350.00. One Max-Flow Filter System with its extra filter elements costs $59.95 and will last the same period of time. Over a year, that's a savings of more than 600%! THAT'S MONEY IN YOUR POCKET! "In the last two weeks we have run more than 6 loads of chip logs, which is the worst stuff. With the short supply of timber, salvaging burned and dead timber is becoming a necessity to remain a viable timber operation. These are the most demanding conditions a saw can be operated in. Without the Max-Flow filter we would be buying new saws regularly. After a year of cutting, I recently had the saw professionally serviced including a complete tear down and inspection. Other than seals, there were no repairs needed and the condition of the saw was outstanding considering the severe usage. The crank bearings were perfect and there was no carbon build up from use. You don't have the spare time to be cleaning the saw filter two or three times daily. More realistically it's just a couple of times a week, as part of a routine cleaning schedule. Only with the Max-Flow Air Filter is this possible. Servicing the equipment is important. The skidder and trucks require daily upkeep. But there are only so many hours in a day. Time spent on maintenance is less time making money." George Barnes is a third generation logger from Port Angeles, Washington. He has worn out more saws than most of us will ever see, but the Max-Flow filter has really impressed him with its performance. "We work 084's and 066's in really big timber. We demand consistent high power from our saws, especially with the long bars and aggressive chains that we run. My whole crew uses the Max-Flow system, every one of them. When we break in a new guy, often times he asks how we get our saws to run so well. I tell him that except for the filter, they're stock. That's the secret to our getting real stump power from the saw." Maxflow is so sure of the advantages of our "Type A Filter System that we offer a 100% SATISFACTION GUARANTEE! If you are not pleased with the filter, return it to us or your dealer for a complete, no-questions asked refund.